International crediting rating agency Moody’s says the suspension of UPND MPs from parliament raises the country’s ability to attract foreign investment and is yet another evidence of institutional weakening. Moody’s says the Zambian regime is currently dealing with external and internal criticism and accusations of sliding toward a dictatorship, eroding investor confidence amid an increased risk of domestic political turmoil. 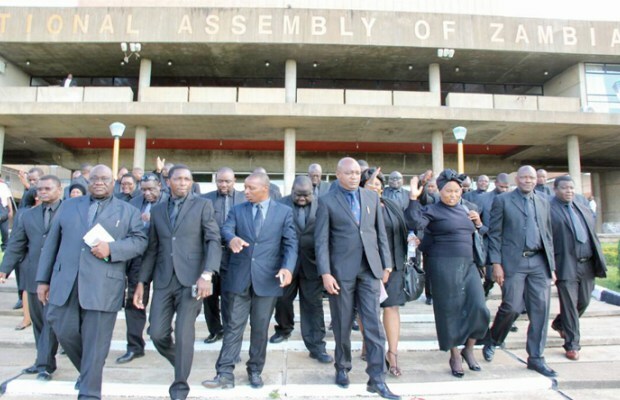 “Last Tuesday, Zambia’s (B3 negative) parliamentary speaker suspended from parliament for 30 days 48 opposition members of parliament from the United Party for National Development (UPND) for boycotting President Edgar Lungu’s speech in March on the grounds that he was not the legitimate winner of the 2016 presidential elections. The suspended members hold 48 of the UPND’s 58 parliamentary seats and their suspension comes as the UPND leader and former presidential candidate, Hakainde Hichilema, is being detained on charges of treason. The members’ suspensions raise the risk of domestic political turmoil that will discourage foreign investment and external support for a wide range of ongoing development projects. Protests and riots broke out across southern Zambia after the results of highly contested elections were announced in August. The member suspensions elevate the risk that violence will erupt again. Because Zambia relies on international investment and aid programmes to sustain and develop its economy, the turmoil is especially negative for its credit quality. The country is in talks with the International Monetary Fund (IMF) to secure funding to prop up its dwindling foreign exchange reserves. Zambia’s main export is copper, and the decline in copper prices has decreased Zambia’s foreign-currency reserves to $2.3 billion at the end of the first quarter, which was only about 2.4 months of import cover and well below the IMF recommended three months. If political tensions were to stall consensus on reforms and lead to a breakdown of the IMF talks, they would depress the country’s development prospects. Falling international confidence in Zambia’s political stability risks harming capital inflows into the country and reducing Zambia’s growth. The members’ suspension is a culmination of longstanding friction between the government and the main opposition party. Although Zambia’s previous overall political stability was a relative credit strength in our credit assessment, the election process and the member suspensions point to a gradual institutional weakening. Moreover, the government is dealing with external and internal criticism and accusations of sliding toward a dictatorship, eroding investor confidence amid an increased risk of domestic political turmoil.